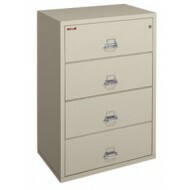 This is an extra large Sentry filing cabinet. 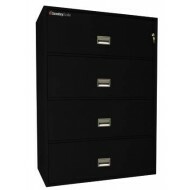 It is 43 inches wide and has four drawers. 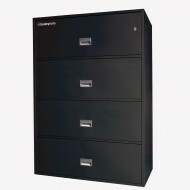 Drawers have large capacity storage for both legal and lateral documents. The rugged suspension of the drawers allows for easy movement even when the drawers are fully loaded. The 4L4300 has a UL 1 hour fire rating. 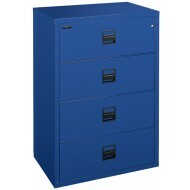 Sentry 4-Drawer Lateral Fire File provides filing for letter and legal size documents.Superior design, three standard color choices, high security lock options and accessories are why the Sentry fire safe lateral cabinets are the preferred choice worldwide.